I once cried tears of joy over a piece of tiramisu (Meg can vouch). For me, “the one that got away” is a strawberry and dark chocolate gelato I dropped on Via Tavolini. One evening in Florence I looked at my Gusta pizza and truly wondered if it was possible that pizza could be my soulmate. As these instances would suggest, I take today’s topic very seriously–food. For me, food is so much more than simple sustenance. It is a sensory experience that helps me connect with the culture, region and people of wherever I find myself. When Meg and I plan our itineraries in Florence, mapping our meals is just as important as our museums. Seems like a potential problem for a couple of travelers on a tight budget, doesn’t it? 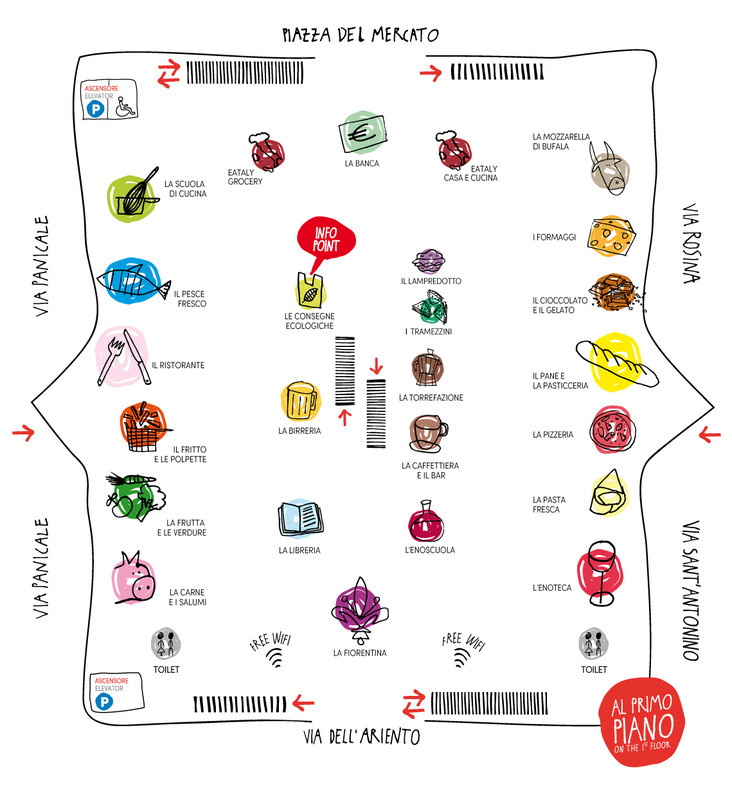 However, with the reopening of the Mercato Centrale in 2014, all of our culinary conundrums were solved! Built in 1874 by the same architect who designed the well-known Galleria in Milan, the market has been remodeled to include, for lack of a better word, a “food court” of sorts on the upper level. All dishes made in the dining area are constructed strictly from fresh ingredients that can be purchased in the market below. The cafeteria-style dining allows you to sample numerous Tuscan specialties without committing to a four-course meal every evening of your stay. The food is affordable, great for tourists, yet also a fast favorite of locals. Finally, the universe has provided the perfect solution to sampling as many local dishes as possible without breaking the bank. Speaking of banks, the market conveniently offers a bancomat (ATM), free WIFI, and restrooms at your convenience. Before the feast begins, you have to get there! The Mercato Centrale is located in the city center, just behind the open air market of San Lorenzo (as well as the basilica). The market is conveniently open from 10 a.m. to midnight every day. The dining area can be reached by taking the steps or elevator in the center of the market to the second (or as they say in Italian, first) level. Food stations surround central, open seating where servers will take your drink order. If you can’t wait to get there to see what types of food you might want to order, take a digital spin around the market on the very sleek and informative Mercato Centrale website. Food stations are conveniently and simply named after the ingredient or dish featured there (for example, i formaggi, il pane, etc). Don’t speak italian? Let your eyes do the browsing before committing to a dish (or two). Ok ok ok ok, on to the food! 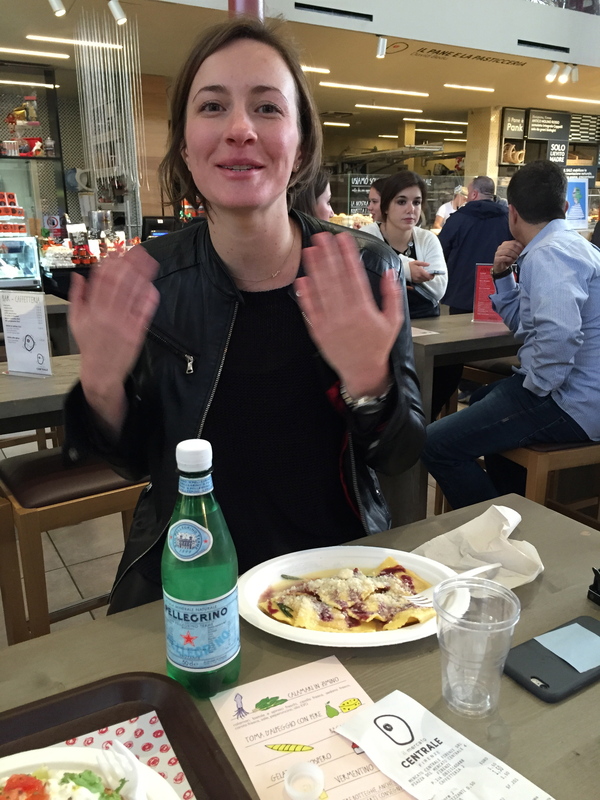 Meg’s had her come to pasta moment with a butter sage ravioli from La Pasta Fresca. 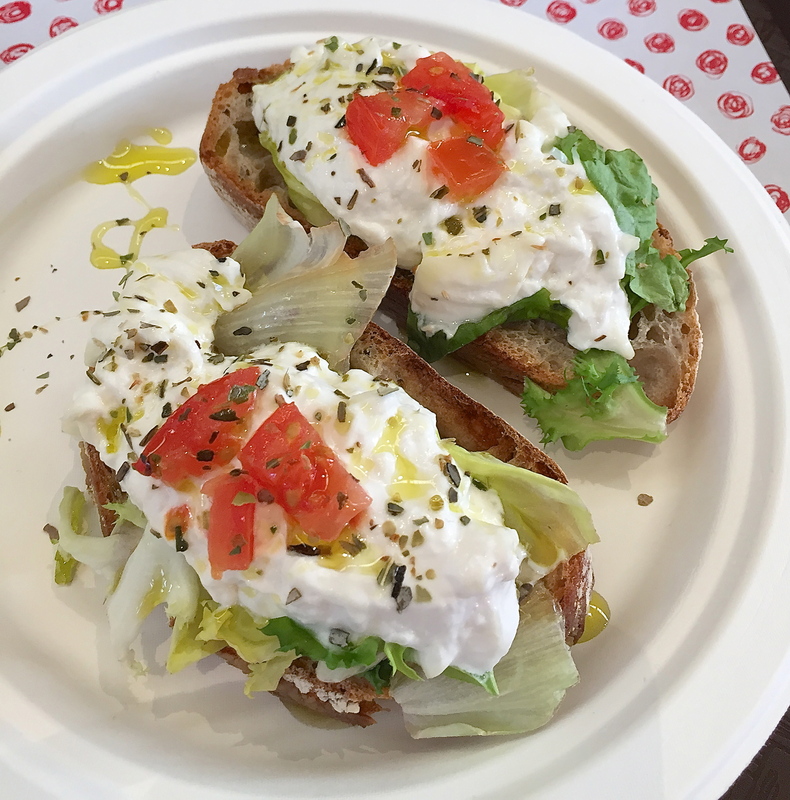 My personal favorite is a melt-in-your-mouth burrata bruschetta from La Mozzarella di Bufala. Our favorite Italian tour guide (and BFF), Suz of Florence in August, both recommends the Mercato to her groups for a tasty and authentic meal, as well as frequents there herself for a late lunch. She suggests trying a sandwich from La Carne e i Salumi (try their homemade sausage!) or a stop by Il Tartufo for something a bit more decadent. The Mercato also offers many vegetarian options, Florentine favorites trippa and lampredotto (both made from parts that can be found somewhere in a cow’s digestive track) and of course decadent desserts from Il Cioccolato e il Gelato or Il Pane e la Pasticceria. Aside from delicious Tuscan delicacies, we would be remiss not to mention that the Mercato Centrale is also an active part of the Florence community. Live music, tastings and tours are offered year round. Keep an eye on their events page or follow them on twitter for the latest. In particular, Meg and I would like to spotlight the collaboration between Quàlita Magazine and the Mercato to bring the series Il MercatoMercantino to the market this fall. Guided tours of a “food exhibition” will feature local food producers who are dedicated to providing and producing pure and authentic dishes (don’t worry, you won’t just be looking, but encouraged to sample the local wines, beers, olive oils and food along the way). Evening events consist of a “Talk Show” featuring local wine and food experts. Get the download on details, dates and tickets here. To Florentines, their food is just as much a part of the culture as their art. So consider the Mercato Centrale the most delicious museum in town! Mangiamo tutti! We love visiting the market early in the morning…it’s always packed with such delectable items that it is hard to resist not over buying…oh, well….a girl’s got to eat, right?!?! LOL! Then, off to Mario’s for lunch…yum!